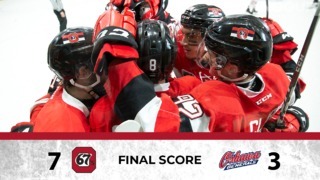 They turned some heads and kept the game close, but ultimately the Ottawa 67’s couldn’t overcome an early deficit and lost 8-4 to the visiting Erie Otters Saturday afternoon. The game, being played at the Canadian Tire Centre due to the world-class Davis Cup tennis event occupying The Arena at TD Place, began with the Otters taking a lead. But Ottawa stormed back to make things interesting in the second. Head coach and general manager Jeff Brown saw some positives in his team’s game, but they just couldn’t get a bounce go in their direction. Erie opened the game with three goals, all coming in the middle portion of the frame. Kyle Pettit had three shots in the first half of the opening frame, and the final one went in the net on the power play. That opened the scoring, then Warren Foegele and Alex DeBrincat added to the total. Ottawa had an answer at 17:39 of the first. Patrick White followed up a chance created by Jared Steege and Mathieu Foget, scoring a garbage goal to cut the Otters’ lead to 3-1. Ottawa came out flying in the second, registering the first six shots of the period in under two minutes. A blistering wrist shot off the stick of Austen Keating would give the 67’s their second straight tally, and made the score 3-2. Sasha Chmelevski had a great chance to tie the game at one end of the ice, but couldn’t convert. Moments later, Erie scored a back-breaking 4-2 goal at 5:05 with Pettit firing home his second of the game. The Otters tallied four more goals toward the end of the game, including three in the third. 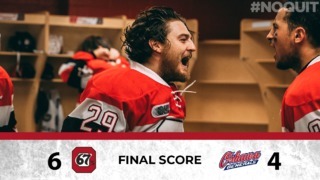 Despite late markers from Noel Hoefenmayer and Ben Evans, the 67’s couldn’t mount a comeback. After facing the first place team in the Ontario Hockey League, Ottawa now takes on the eastern conference’s top team. 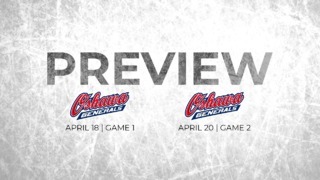 They host the Peterborough Petes Wednesday night, in their return to The Arena at TD Place. The puck drops at 7 p.m.
Tickets for all Ottawa 67’s home games are available at Ottawa67s.com, calling 613.232.6767 X1, or in person at The Box Office at TD Place. All minor hockey players part of the 67’s Prospect Program presented by Enercare get in for FREE. For more information on the 67’s Prospect Program click here. Tickets for our REDBLACKS and Fury FC Game are available by clicking here, calling 613-232-6767 x1, or in person at the Box Office at TD Place.